SOG CD02-L CD-02 Creed Black TiNi Knife FREE SHIPPING! The dramatically-shaped CD-02 Creed Black TiNi knife from SOG offers high performance in extreme outdoor and hunting conditions. The broad, straight-edged blade features a heavy front end, allowing it to chop and pierce with ease. The long cutting belly also makes it extremely effective for slicing, offering a great deal of versatility. The stainless steel is finished with a titanium nitride finish, protecting it from wear and preventing light reflection that might give away your movements. Featuring SOG's Tech Bowie handle with non-slip Kraton rubber, the Creed offers a secure and ergonomic grip even in wet weather. SOG's knife comes with a tough leather sheath for secure storage and portability. 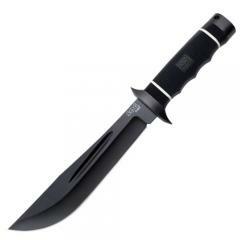 ©2002-2019 CopsPlus.com: SOG CD02-L CD-02 Creed Black TiNi Knife FREE SHIPPING!